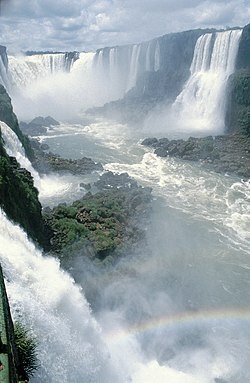 Iguaçu Falls are a series of massive waterfalls that lie on the border of Argentina 80% and Brazil 20%. It is fed by the Iguaçu River, which flows into the Paraná River. 275 individual waterfalls side by side, some as tall as 269 feet (82 m), make up the falls, though most are around 210 feet (64 m). The falls divide the river into the upper and lower Iguaçu. It is one of the largest and most famous waterfalls in the world, receiving thousands of visitors each year. This page was last changed on 19 January 2017, at 16:09.